Two Armenians, standing next to a Turkish woman whose hands were tied behind a tree, were tossing up for pitch and toss (pitching pennies).. Their ancestors played this bloody gambling 100 years ago at Kars, Ağrı, Van, Erzurum and other cities of Turkey and recently these Armenians performed their bloody-gambling with what they have been taught at Khojaly, Azerbaijan. - “Akçik, manç?..” meaning “Girl or Boy?” in Armenian (աղջիկ, տղա). The one who bet on “boy” suddenly rip the woman’s belly up by his bayonet and the un-born baby was loosen out of the slash of its mother’s belly. 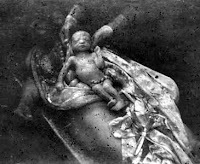 While the baby was struggling, its novel cord still being attached to its mom, the Armenians were checking the gender of the baby from its genital organ. - I won but how can this baby be fed? - Of course, its mom will feed it. Upon this, the short Armenian thrust at the baby with his bayonet and lift it up to show its mother who was still alive while meanwhile saying again and again “breastfeed the baby!”, “breastfeed the baby!”..
- His head is bold and small; will be easy to play with. CUT OFF! The body fell down one side and the head to another side. With their bloody army boots they hit the little kid’s head as a soccer ball over and over again. The same atrocity was performed in various places at Khojaly in the 26th of February 1992, being witnessed in person by several Azerbaijani Turks that survived from this massacre of Armenians. 20 years from now a barbarous massacre, like the recurrence of the history, with the same atrocity being performed on Turkey’s Turks: shows an obvious evidence of the racist hate of Armenians to Turkish nation.